I used to work and Bath & Body Works and hated it! Why? Because I would spend almost my entire paycheck buying half the store haha. No, I really did love my job. I worked there for 4 years and stopped because we moved. One of my favorite things to buy were the candles. OMG they smell A M A Z I N G! I stopped by the other day and did a little shopping, kinda of made me miss working there. They have some new scents and I'm dying to buy them! Here are a few of my favorites! I've had all except Garden Fiesta. The picture is so pretty I almost want to buy it for that reason alone. Another thing i'm currently obsessed with is Scentsy. My friend introduced me to it and I was hooked! My all time favorite scents are Luna and Flirtatious they smell so good! The warmers they sell are also so stinkin cute. I currently have the owl and I'm burning Luna in the living room and Flirtatious in my bed room. 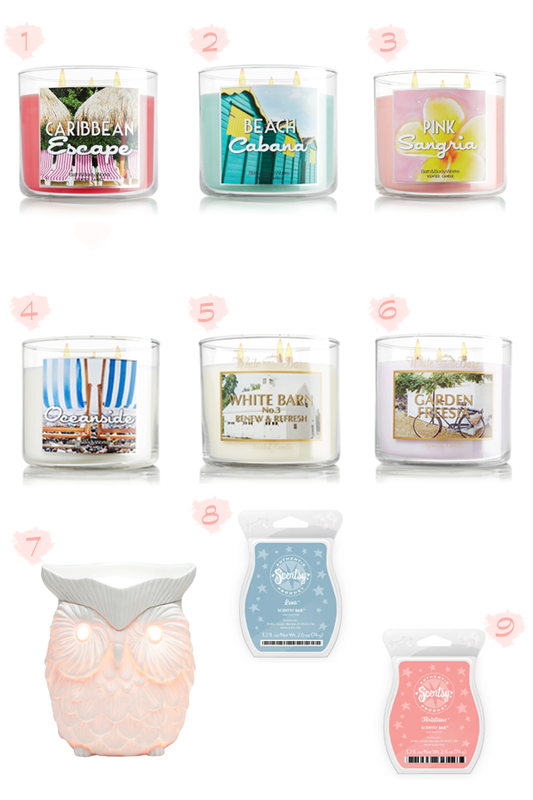 What are your favorite candles or scentsy scents?